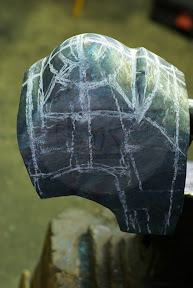 Soon I will add photos of improve version of hardened Churburg arm harness. Ohh, they look very nice. 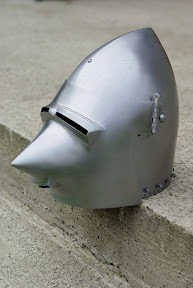 If I may ask, how much would you charge for a normal helm such as that? I've been looking at your website but there is no price indication (at least, not on the English version). I send you PM with prices. 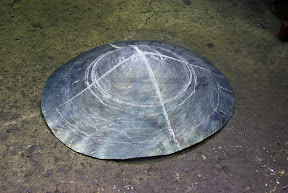 They are made of medium carboon steel of different thickness: 1,5 mm, 1,2 mm and 1 mm. Weight of one arm is 1,2 kilos and spaulder 500 grams, so they are very light. They final hardness is 38 - 42 HRC = 372 - 416 VHP. More photos on my webiste. I'm preparing now a new section with photos during the producions of various harness. On my webiste you can also find new version of Churburg leg harness. You said that it is made from 1.5mm but is the final version 1.5mm thick? If so that sounds way on the light side of things. You said that it is made from 1.5mm but is the final version 1.5mm thick? 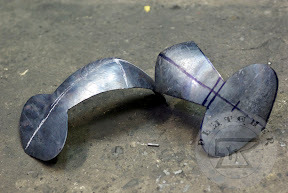 I start work with 1,5 mm medium carboon steel, after forging, planishing and grinding it's final thickness is about 1,2 - 1,4 mm. It's time to present few new armour parts. 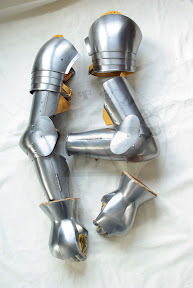 Some arm and leg harness from the middle of XIV c.
Full arm harness for late XIV c.
And most interesting is hardened breastplate with skirt based on exposition of men-at-arms from altar in Pistoia cathedral, dated about 1370 c.
I invite you to my website to see more photos. Finally I have made my first hundsgugel bascinet. 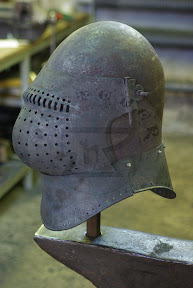 Helmet based on A69 visored bascinet from Wallace Collection. 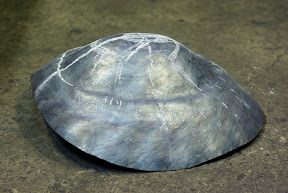 The skull was welded from two hot raised 2,5 mm steel pieces but the visor was made from one 2 mm steel piece. That looks very nice! Can you tell us how much it weighs? Or did you already ship it off to the customer? I still have helmet and I had already put it on balance. 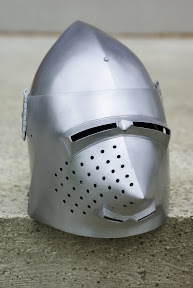 The weight of the helmet is 3,8 kg. Original A69 piece have 2,87 kg. Today I want to shear with you few new pieces which I made since last update of my website. 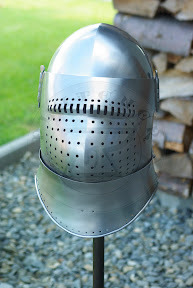 The most interesting news is a great bascinet fully made from medium carbon steel, heat hardened and tempered to hardness about 40-42 HRC. 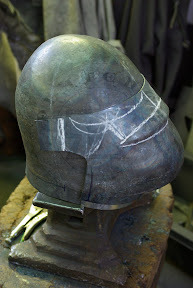 The skull and the visor are hot raised, each from one piece of steel. 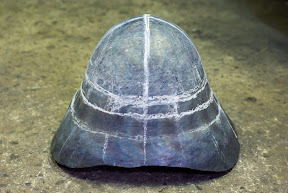 It's my first halmet with skull made from one piece of steel, and this was a big task to manage. 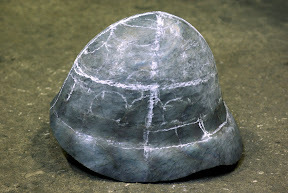 The skull was made from the circle of 2 mm thick steel, after many many days of raising the thick on the top is about 3-3,2 mm and on the bottom edges about 2 mm thick. 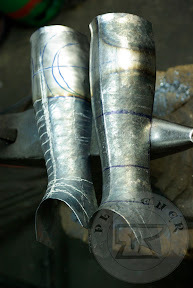 Full greaves with sabatons for second half of XIV c.
Hundsgugel bascinet based on helmet CH16 from Churburg. Made from medium carboon steel, skull welded from two halves of 2 mm steel and visor raised on hot from single piece of 1,5 mm steel. Weight 3,2 kilos. 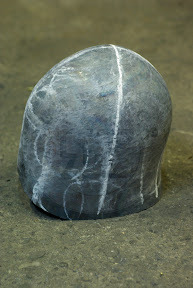 More photos and more new pieces you can see on my website. 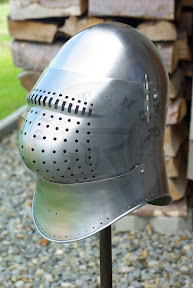 I once tried a little armour making. I have the greatest respect for your craft. The great bacinet and your new projects are really beautiful. Your work just keeps getting better all the time. I always look forward to something new by you. Well done. 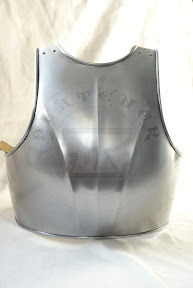 Thank you Peter Johnsson and Peter Cowan That give me motivation to try make better and better armour. This time I wish to present you some interesting news which I made recently. 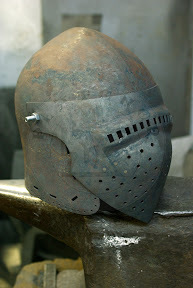 My third helmet with skull raised from one piece of steel. 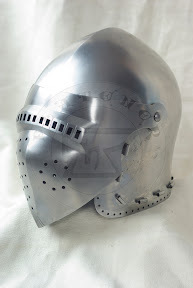 This time it's klappvisier bascinet inspired by italian iconography from second half of XIV c. It's made fully from medium carboon steel, heat hardened and tempered. The leg harness inspired by inconography from begin of XV c. The most unusually is poleyn which is made from steel and brass gilded. 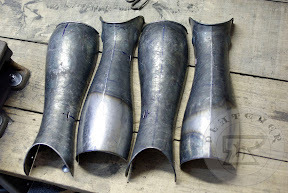 I add new fully heat hardened arm harness for late XIV/begin of XV c.
Also in the topic of leg harness I update some older models: the Churburg and Charles VI harness. In "Full suites" section I add a set for the begin of XV c. More photos on my website.